Details and registration information are available for download in brochure-form (PDF). 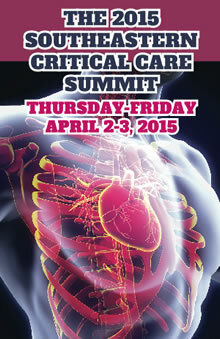 The 2015 Southeastern Critical Care Summit will provide targeted education on common critical care conditions and procedures to a variety of critical care medicine providers with the aim of improving care across the provider spectrum. The Summit will be held April 2 and 3 at the Emory Conference Center and Hotel and is sponsored by Emory University School of Medicine, Department of Medicine, Division of Pulmonary, Allergy and Critical Care Medicine. Critical care is one of the most multi-professional and team-oriented clinical areas in health care, and one where the quality and value of health care delivery varies significantly despite substantial medical advances in recent years. Guide the development of implementation strategies for increasing quality and efficiency in delivering critical care. The program includes interactive and case-based lectures from multi-disciplinary physicians, nurses, nurse practitioners, physician assistants, pharmacists, respiratory therapists and administrators, as well as hands-on teaching in breakout sessions, roundtable and small-group discussions. Plenary lectures for the 9th Annual Summit will be delivered by Roy Brower, MD, professor of medicine at Johns Hopkins University, medical director of the Medical ICU at Johns Hopkins Hospital and chair of the PETAL Network; and Ruth Kleinpell, PhD, RN, FAANP, professor at Rush University College of Nursing in Chicago, director of the Center for Clinical Research and Scholarship at Rush University Medical Center, and president of the World Federation of Critical Care Nurses. Details and registration information are available here.